Thank you for your interest in DHR’s Historic Registers program. By undertaking a nomination project, you are contributing to the public understanding of Virginia’s history, architecture, and archaeology. Please know that there are no “typical” nomination projects, as each place has been shaped by its own unique circumstances. The same nomination packet is prepared for both the Virginia Landmarks Register (VLR) and the National Register of Historic Places (NRHP). Although listing in both the state and national registers is honorary, there are stringent standards regarding the historical research, photography, mapping, field inspection, and architectural analysis that make up a nomination packet. To meet these requirements, you will need to be patient, thorough, and detail-oriented. If you are new to the Historic Registers program, please refer to this step-by-step breakdown of the register process. Next, contact the DHR Regional Preservation Office that serves the area where your property or historic district is located. A regional staff member will be your first point of contact as you begin work on documenting your property or district. DHR manages the registers program as a two-step process consisting of evaluation for eligibility and then nomination for listing on both registers. Clifton Forge Armory, Alleghany Co.
Hiram Clem Farm, Shenandoah Co.
Pine Creek Baptist Church, Floyd Co.
A completed PIF is evaluated first by DHR’s internal evaluation committee, which is made up of staff members with expertise in history, architectural history, and archaeology. This committee recommends if an individual property, archaeological site, or a proposed historic district should proceed to listing in the historic registers. If DHR staff recommends a PIF proceed, then the staff will present it at the next available quarterly meeting of the State Review Board. The SRB may concur with the staff recommendation, request further information, and/or make specific recommendations on aspects of preparing and improving a final nomination. A PIF for the “O. J. Rudacille General Merchandise” building was presented to the State Review Board during a quarterly meeting. 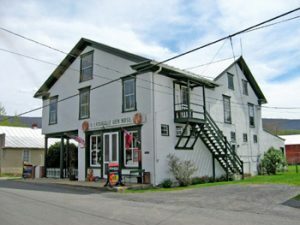 The building, which combines a general store and residence, was built in 1884 and is located in Warren County. If the SRB green lights a PIF during one of its quarterly meetings, then you may proceed with preparing a formal nomination for the state and national registers. As you prepare the nomination, DHR’s regional staff will continue to serve as your first point of contact throughout the process. Refer to the Register Nomination Checklist for detailed instructions about preparing a nomination packet. Both Virginia VLR and National Register both were established in 1966. For more than 50 years, DHR has continually maintained high standards for the evaluation and nomination process. Listing is thus selective and honorific. DHR staff will be glad to answer questions regarding the Register program and the PIF and nomination process and procedures.